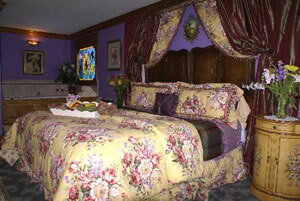 Eureka Springs Arkansas Bed and Breakfast Angel at Rose Hall. Romantic elegance can be found here, from the cozy corner fireplace to the King Jacuzzi tub which is brightly illuminated by a colorful stained glass window in hues of lavender and purple. King bed and King size room adorned with oak antiques, private bath with shower, telephones, ceiling fan, individual climate control and a covered balcony with a porch swing. This room has an exceptional view of the garden and gazebo below. Website hosting by HyperActive Concepts, Inc.